If you want to be comfortable in your home in Spokane, it is very important that your home has proper thermal insulation. If you have noticed drafts in your home, or it just seems like your insulation is not containing heat the way it should, it may be time to consider replacing your current insulation with something that would be more effective. However, while it's important, the R-value does not tell the whole story. Traditional forms of insulation can leave gaps that allow heat to move freely from one room to another or from indoors to outdoors. That's where spray foam installation comes in. It is an increasingly popular choice in Spokane because it is an expanding foam that fills the space available to it, so it does not leave the same kind of gaps other types of insulation can. It insulates as much as 50% better than traditional insulation, saving you money and energy for heating and cooling. It also effectively reduces noise, because it prevents sound waves from traveling through the air between floors or walls. Best of all, because it is a spray, it can be installed without removing existing walls. All that's required is to drill a few small, easily-repaired holes into the wall, and the insulation is sprayed in to fill the space. You can have new insulation installed without the chaos and mess of tearing out your old walls. Despite these benefits, spray foam is toxic until it dries, so it is critically important that it is only installed by trained professionals. If you live in Spokane and you think your insulation needs to be replaced, call us today for a consultation and quote. We use Demilec USA spray, pour and inject foam – an industry leader with green products. Vapor barrier: Always install closed cell where there is continual high humidity, i.e., swimming pools, saunas, spas. Air Barrier: Both open and closed cell foams are air barriers. It’s a matter of thickness! Closed cell becomes an air barrier at 1 1/2″+ and Open cell at 3 1/2″. Shear: Strength for walls and roof. l Closed cell will add up to 300%, though not general recognized by engineering. $’s: Open cell is the better buy. Per 1000 lb. of product, open cell makes 15000 board ft., and Closed cell makes 4500 board ft. Expansion Rate: SPF – Spray Polyurethane Foam has an expansion rate of 120% for open cell foam; 30% for closed cell foam. Thus for complex framing, narrow and difficult spaces, open cell is always the best! Open cell is a “crack seeking” product! Acoustical: Open cell by far is the best, as it’s soft and absorbent to sound. Injection: Injection is only available with an open cell product. Closed cell will overheat above 2″+, with likely a bad cell structure and possibly inner charring, with combustion a possibility! strong>Pour foam: Pour foam is available in both open and closed cell foams. Wind up-lift: Closed cell in particular is developing a reputation for holding roofs on in high wind events. Consider the weather conditions when taking a commercial flight: Temp 68 degrees Fahrenheit below 0; wind speed: 500 MPH +; “R” value – None! Your comfort is the product of air seal and lots of Btu’s. Air seal without “R” value helps but “R” value without air seal means nothing! An “R” value test is done at 75 degrees Fahrenheit. That is the temperature at which we would not insulate, but it is the temperature which we get the highest “R”. If we raise or lower the test temperature 50 degrees Fahrenheit, we cut the “R” by 50%. The tested “R” is at 0 wind and 50% relative humidity. Fiberglass “R” fades with temperature change, which applies to all fibrous insulation, in contact, foam is a very stable “R”. The US Department of Energy claims that 40% of heat loss in US homes is simply air infiltration/exfiltration. That leaves 3% off perfect. What’s perfect worth to you? Fibrous insulation only begins to perform thermally as the wall assembly is enclosed. The closer the wall assembly comes to air seal, the better the fibrous insulation performs. What the contractor fails to think of, is that a sealed wall has no way to dry when it experiences an exterior leak, or a dew point event which is highly likely with fibrous materials. We recommend wall assemblies with well planned and executed “drainage planes” (so if water gets behind the siding, it can simply drain to the ground, rather than enter the wall cavity). I prefer a wall cavity have the ability to dry out should water enter. Who can guarantee never a leak or a “dew point” event? In my opinion, visqueen on the interior is an absolute violation of good building practice. Homes built prior to the 80′s, generally have sound walls, but a “super good cents” home, put visqueen on the inside, Tyvek type products went the outside and OSB became a common part of the wall assembly. Mold began to become an issue in our walls. Let the wall cavity breath. Let foam be the air seal. Let foam be the vapor barrier. Manage your inside humidity at 45%. By the way, 1/2 ply & OSB are actually classified as vapor barriers! If you must have a “vapor retard” on the inside, use a latex primer – it’s code legal! Can the Cost Difference Be Recovered? Yes, you will be able to recover the cost difference between Spray Foam insulation and fiberglass! Our typical SPF house is 5 times tighter than the typical fiber filled house. This equates to a minimum 33% reduction in your heating and air conditioning bill. At present energy costs, payback begins in 5 to 6 years. Properly sized HVAC located inside the conditioned space will allow SPF to give you it’s greatest savings. For those concerned about interior air quality, SPF air seals, greatly reducing dust and pollens. The product itself is cellular, rather than fibrous. Consequently, it does not become air born with the HVAC system. Anyone who has vacuumed old fiberglass or cellulose out of attics realizes the products decompose over time, even more prone to infiltration. Ice damming is greatly reduced or eliminated with SPF. It’s generally the product of heat escaping into the attic. Sunshine can be another source of ice dams which can’t be helped. SPF adheres to 99.9% of all surfaces, glass and visqueen being exceptions. It is a fantastic glue! The major SPR manufacturers today are all making respectable products. The applicator makes or breaks the manufacturer. An applicator must know how to read his particular product, and how to adjust temps, pressures, chambers, surface temps, air temp, humidity, etc. Who’s a good applicator? No substitute for lots of experience! The manufacturers are continually starting new applicators, and a beginner is never skilled! Their entry training qualifies no one. The industry desperately needs an apprentice program! Presently, the industry in iniciating “certification” programs. It’s a step in the right direction, but does not guarantee you good work. Our crew is certified, and with top grades at that. A word to the wise…out of sight, out of mind – your job won’t be done any better than the integrity of the appllicator with the trigger in their finger, also foam can look good on the outside, but have poor cell structure on the inside, and detachment on the back side (particularly 1/2 lb. spray foam). But what’s facinating, is that the worst foam job is much better than the best fibrous installation. Everyone has bad days. P.S. I’m proud of Demilec USA. I’ve seen them require installers to remove their bad work! As a young builder in Bellevue, WA, just a few years out of college, I first saw spray foam being applied to the Seattle King Dome roof about 1973. Instantly being impressed, I knew I was looking at a product without equal in thermal performance and durability. In 1978, we were building a waterfront custom home on Lake Washington. The architect failed to leave out enough glass to allow sufficient wall shear. I suggested to my client who was an engineer, he investigate SPF, not only for insulation, but the needed shear. Though not recognized by the engineering community generally, it worked wonderfully! As our building years rolled on, no one was interested in SPF, so we forgot the product. Then in 1990 a good friend in Seattle went into the “building defect investigation business”. (In the decade of the 90′s, he managed over a billion dollars of repairs.) As he told me the horror stories, I became concerned. In 1998 we began to aggressively investigate “Building Science” for 3 1/2 years, reading, going to seminars, asking lots of questions. Observation became ever more a way of life. It became clear that there is quit a lack of agreement among building scientists whether engineers of PhD’s of various disciplines. But then what’s new in the world of science, just visit two local physicians for diagnosis, and they may differ 180 degrees! What did become quite clear in the seminars we attended, was agreement that SPF was the single most significant choice a builder could make to stop “dew point” within the building envelope. I am amazed that 15 years later, the articles dealing with building science and the building envelope seldom acknowledge the role of “dew point” in building defect! 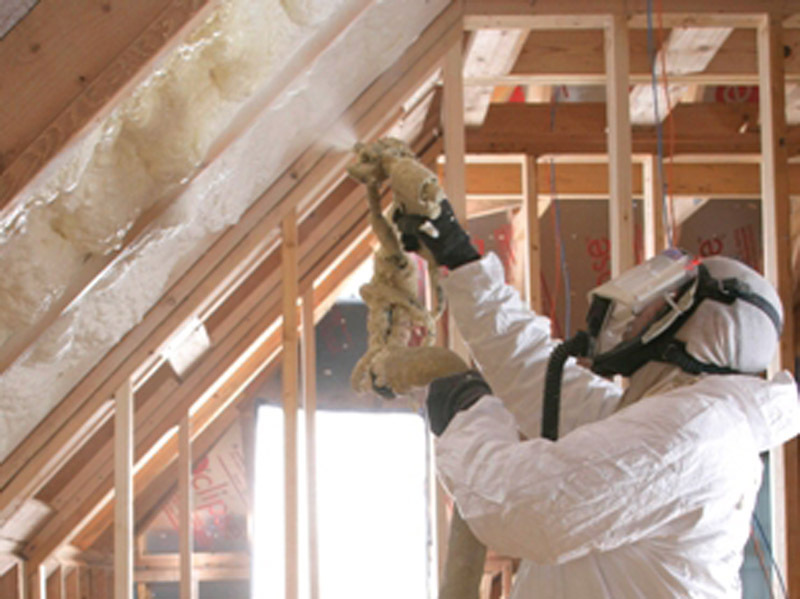 In 2002, we began to spray foam under the name AirSeal Insulation. It’s been a steep learning curve, we never cease learning. We have used the same applicators for 8 years now, and they are masters at masking, scaffolding, application and cleanup. We have accomplished $6 million in business all in the pursuit of excellence! Bob with AirSeal Insulation, Inc.